Iran saw nationwide demonstrations by all social sectors in the beginning of January. The uprising revealed that the regime is sitting on shaky grounds and continues to impact the atmosphere in a society that is simmering with discontent. Observers believe that the conditions will never go back to the pre-uprising status. The wave of protests kicked off on December 28 in Mashhad, rapidly spreading to over 140 cities across the country in a matter of few days and carrying on incessantly for two consecutive weeks. Women played a remarkable role in these protests and demonstrated unprecedented courage. Not only were they present in all the scenes but they had a leading role and inspired everyone. The Iranian regime responded to these extensive protests by massive clampdown and arrests. Political prisoners incarcerated for their activities in defense of human rights, tried to convey their voice to the protesters during the uprising and declare their solidarity with the people who participated in the protests. Among these resistant prisoners were Atena Daemi and Golrokh Iraee who sent out inspiring messages, joining ranks with the protesters. In the wake of these messages, the two courageous women were summoned to the court of Evin, on January 16, 2018. Atena Daemi and Golrokh Iraee declared that they would not appear in the court since they had not received a written summon and were not informed of the reason for it. The summons was repeated four times, and the two brave prisoners refused to give in to the illegal interrogations. Finally, on January 24, 2018, they were taken for interrogation to the IRGC Ward 2A in Evin with a new case fabricated against them. Atena Daemi and Golrokh Iraee put up a staunch resistance again, and refused to answer the questions asked by the interrogators. IRGC agents beat up the two enchained women and transferred them illegally to the notorious Qarchak Prison in Varamin. Qarchak Prison of Varamin is a detention center for ordinary and dangerous women criminals. Living conditions there are deplorable. Political prisoners are transferred there in breach of the principle of classification and separation of prisoners, to experience more physical and mental torture. In the wake of such illegal measures by the IRGC, protests took shape in support of the two resistant prisoners. The family of political prisoner Atena Daemi wrote a letter to Ms. Asma Jahangir, the UN Special Rapporteur on the situation of human rights in Iran, and urged her to have their daughter released. At the same time, political prisoners Arash Sadeghi (Golrokh’s husband), and Soheil Arabi went on hunger strike in support of Golrokh and Atena and in protest to their brutal and illegal transfer. On Saturday, January 20, 2018, the State Security Force in Robat Karim ran over a woman participating in the protest of people cheated by financial institutes. On January 15, 2018, security forces took hostage the mother of a student activist in Tabriz to compel him to report in. This student activist is in Turkey and his mother suffers from heart complications. The Iranian regime’s repressive forces resorted to extensive arrests including hundreds of women during the nationwide uprising in Iran. Dozens of girl students are among those arrested. 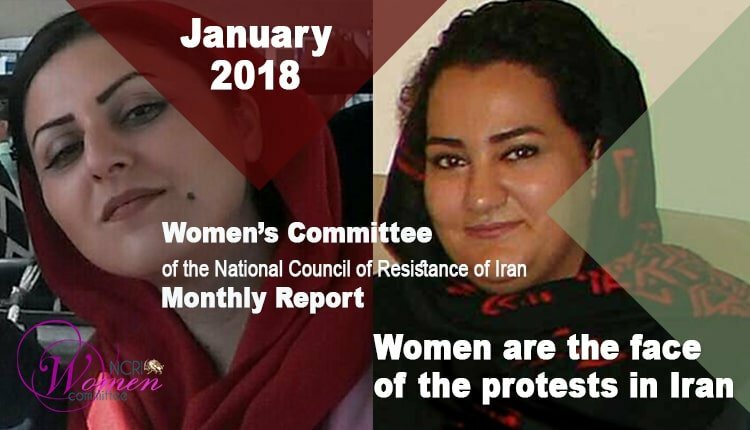 The arrests of Touran Mehraban, Leila Hosseinzadeh, Faezeh Abdipour, Yasamin Mahboubi, Soha Mortezaii, Negin Arameshi, Neda Ahmadi, and Sepideh Farhan have been confirmed so far and reported by the NCRI Women’s Committee. Touran Mehraban, Faezeh Abdipour and Leila Hosseinzadeh have been released after the protests of their families and friends. The state-run media in Iran have acknowledged in different reports the arrests of at least 21 women in 9 days of the uprising. Six women, who according to the police of Robat Karim (Tehran Province), three of them had instrumental role in the protests were arrested in the town of Parand, 14 women were arrested in Arak and one woman in Saveh. These have been announced by the state-run press and media. The actual figures however are much higher. Post uprising arrests continue. At least seven women in Saqqez, and another seven Kurdish women in the cities of Orumiyeh, Kermanshah and Ilam, and two women in Mashhad have been arrested in the days after the uprisings. Reports indicate that an unknown number of prisoners are held or interrogated in secret detention centers or in the detention centers of the Intelligence Ministry and the Revolutionary Guard Corps (IRGC). According to the sources of the National Council of Resistance inside Iran, at least 400 women were among those arrested in the course of the recent protests in the city of Izeh, in southwestern Khuzistan Province. In some instances, all members of the same family have been imprisoned. Most of the arrested women in this city are being kept in a rehabilitation camp for the addicts, and they are spending their days without food or water. On the other hand, in Tehran, the family of another arrested woman Sepideh Farhan (Farahabadi) has been following up her freedom to no avail. They have been told that their daughter is not going to be released for the time being. She is deprived of the basic right to have an attorney and to have family visitations. So far, a dozen of the arrested protesters have been killed under torture in prisons. In an extensive international campaign, Maryam Rajavi has urged all democratic governments to exert pressure on the clerical regime for the release of all arrested prisoners, particularly the women who are imprisoned under torture and face the death sentence. The Women’s Committee of the National Council of Resistance of Iran has also launched a number of campaigns for the release of women political prisoners and those arrested during the uprising. In these efforts, the NCRI Women’s Committee needs the support of all freedom loving women of the world.